Wildlife experts in India are looking for a bull elephant accused of killing 10 female elephants. A 15-member task force has been formed to keep an eye on the elephant's every move through the Periyar reserve forest in the state of Kerala. An official told the BBC that the elephant's behaviour was because of a testosterone surge which leads to more aggression in bull elephants. Eight females were killed last year and two others were found dead last month. "Looking at the post-mortem reports of the dead females and other evidence that our team has gathered, we are sure that they were all killed by the same tusker [bull elephant]," Kerala's Chief Wildlife Warden KK Srivastava told the BBC. He said one of the tusks of the elephant is damaged and had become "very sharp" which "pierces the female body", resulting in the deaths. The animal is a "young male" between "20 and 30 years of age" and is 2.74m (9ft) high. Officials say they would like to tranquilise and catch the animal so that its tusk can be trimmed. But before they do that, they say that they want to make sure that the animal does not come to any harm. "The terrain in the reserve is hilly and there is a reservoir. Once the animal is hit by the tranquiliser, it begins to run. We are worried it might get killed. So we cannot take a risk," Mr Srivastava said. He said the fact that the elephant has killed only two females this year may mean that he is getting better. "We'll watch him for this year before we decide to do anything. Maybe he'll just get better on his own," he said. 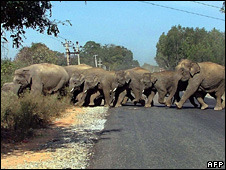 Periyar has about 800 elephants, but the gender ratio is skewed - there are 79 females for each male in the park.